This recipe for Risalamande is properly the most famous and traditional Danish Christmas dessert that you can make. 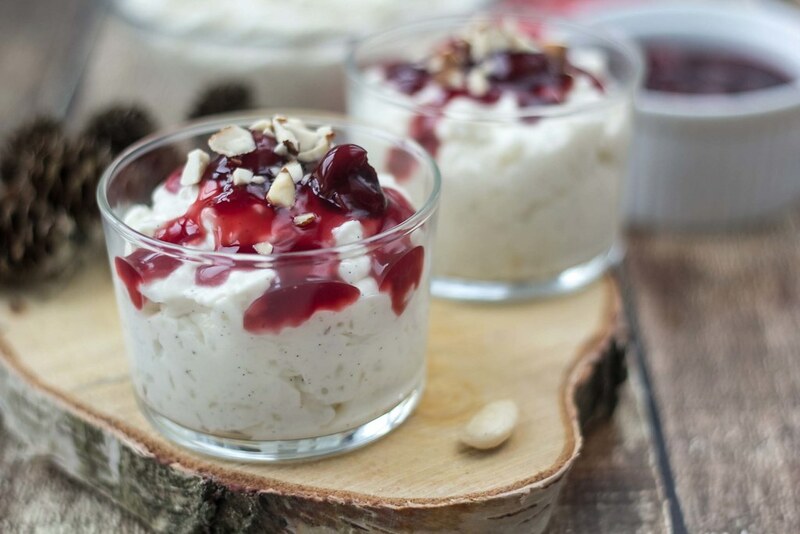 Risalamande is a rice pudding with vanilla, almonds and whipped cream, and it’s typically served together with warm cherry sauce. The word Risalamande comes from the French word Riz à l’amande, which directly translated means rice with almonds. There are many different ways of spelling the word, Ris a la mande, Ris à l’amande and Ris ala mande just to name some, however, we have been told that the most correct way should be Risalamande so that’s the way we spell it. Risalamande is more or less only served as a Christmas dessert right after the dinner at Christmas eve. In Denmark, and most of the Nordic and European countries, we celebrate Christmas at Christmas eve and not at Christmas day like in the US. The typical way of spending Christmas eve is getting together with family, have a nice Christmas dinner and exchange presents. The typical Danish Christmas eve dinner consist of roasted pork or duck served with boiled and glazed potatoes, braised red cabbage and brown sauce, and for dessert Risalamande. When the Risalamande is serve it’s both a very delicious dessert and a funny game. The Risalamande contains a lot of chopped almonds. It’s a great tradition that the person who make the dessert leave one almond unchopped. This extra whole almond is now mixed into the Risalamande. When the dessert is served the person who gets the whole almond in his/hers serving wins a prize. The prize is typically a smaller present worth about 15-20$. Because the whole almond is hidden in the dessert this will often result in a lot of very full stomachs. If the almond is in the bottom of the bowl people normally keep eating until they have found the almond and won this prize – but that’s just a funny part of the game. Risalamande is a very delicious and creamy dessert. It’s made by boiling rice, milk and vanilla into a rice pudding and then add sugar, whipped cream and chopped almonds. 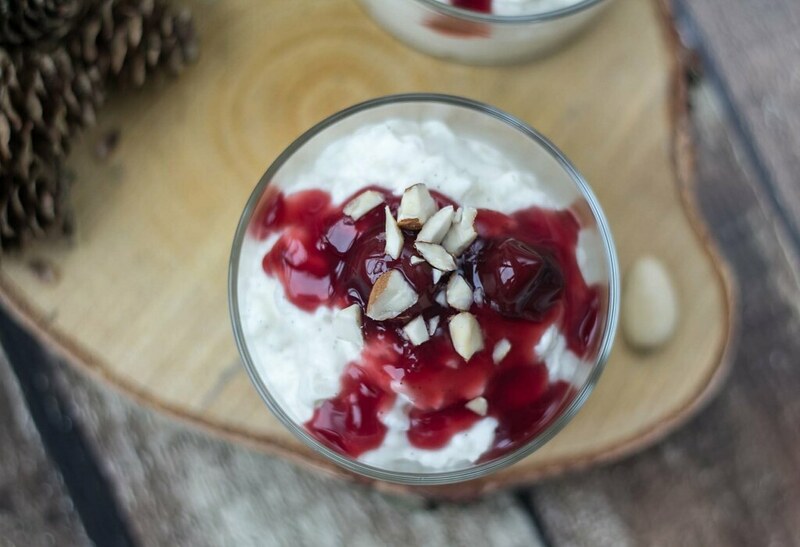 The dessert is normally served with warm cherry sauce and it’s super delicious. 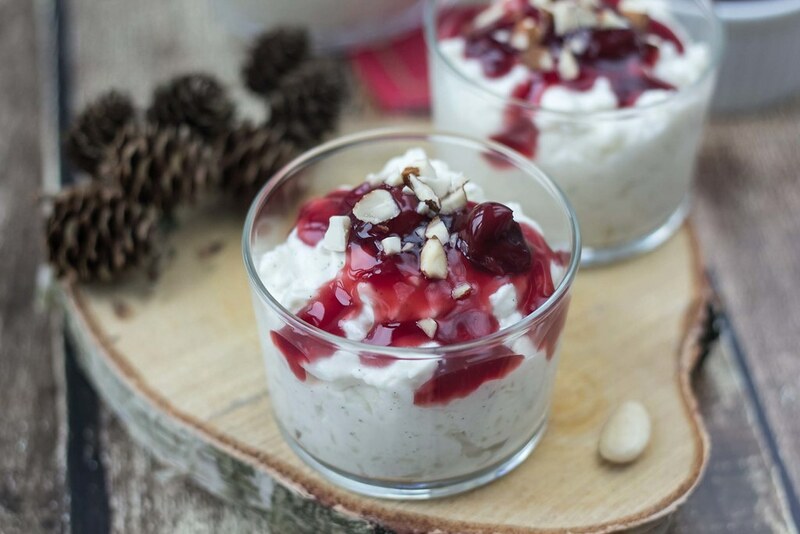 Some people make the rice pudding the day before Christmas eve and eat some of it for dinner – on the day of Christmas eve the leftovers, of the rice pudding, is mixed with sugar, whipped cream and almonds and served as the dessert after the Christmas dinner. This is a smart way to save some time in the kitchen on the busy Christmas eve because you don’t have to spent an hour boiling and preparing the rice pudding. This is properly the most traditional Danish Christmas dessert you can have. Enjoy! Start by making a portion of traditional Danish rice pudding. 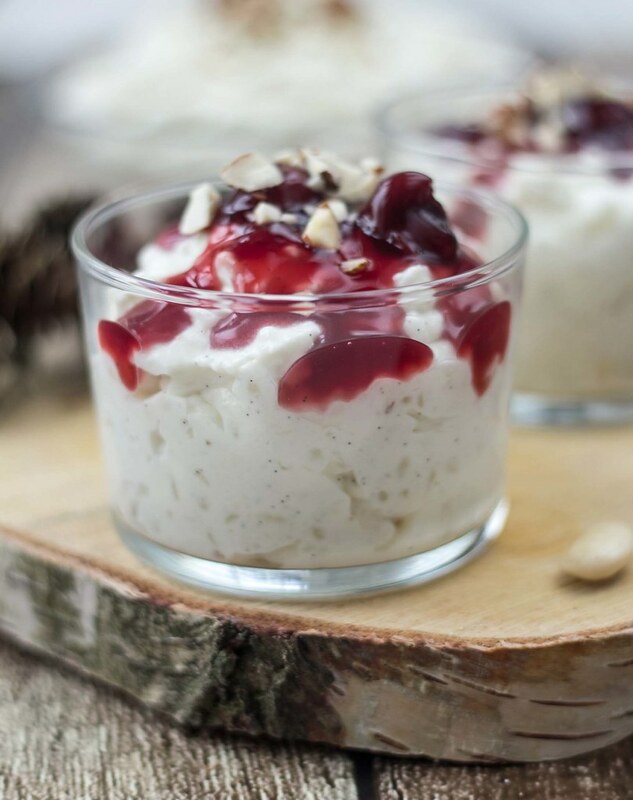 You can eat the traditional Danish rice pudding as it is, therefore we have made a separate recipe for rice pudding – however, you can also just follow the instructions below which is slightly changes because it’s used to make Risalamande. The only difference between the two recipes for rice pudding is that the Risalamande version of the rice pudding has vanilla in it and no salt. However, you can use both versions of the rice pudding recipes to make the Risalamande, we have done that many times. Step 1: In a sauce pan add the rice and the water. Boil it for about 2 minutes. Step 2: Add the milk to the pudding and let it boil while stirring. Step 3: Add the vanilla from a vanilla bean. Also add the empty vanilla beans to the pudding they still have a lot of flavor. Step 4: Boil the pudding under a lid at low heat. The rice have a tendency to burn to the sauce pan so remember to stir regularly. Let it boil lightly for about 35 minutes. Step 5: Remove the vanilla beans. The rice pudding is now done. Let it cool of in the fridge before you proceed to make the Risalamande. You can with advantage make this rice pudding the day in advance. Step 6: Boil some water and pour it in a small bowl. Add the almonds and let them soak in the hot water for about 5 minutes. One-by-one take the almonds up and press them between two finger so that the peel separates from the almond. Step 7: Coarsely chop the almonds and mix them with the cooled rice pudding. Step 8: If you used the completely traditional recipe for rice pudding and boiled the rice pudding without the vanilla beans, then add the vanilla of the beans to the pudding. This is done by slicing open the vanilla beans and scrape out the seeds using a knife. Mix the vanilla with 2 tablespoons of sugar, add it to the cold rice pudding and mix well. Step 9: In a separate bowl, beat the heavy cream into a whipped cream. Step 10: Gently mix the whipped cream with the rice pudding. Step 11: The Risalamande is now done. Put it in the fridge until serving. Tip: Serve the Risalamande with some warm cherry sauce. If you want to play the traditional Danish almond-game (mandelgave), leave a whole almond without the peel in the Risalamande – who ever gets the whole almond wins a small prize. Yeah a marzipan pig is a classic ‘mandelgave’ in many danish homes. My mother, who was just a baby when her parents immigrated from Denmark, made this every Christmas Eve, but only put in one whole blanched almond. No chopped almonds or cherry sauce, but she put a goodly amount of ground cinnamon and raisins mixed into the pudding. The mandelgave was often a game that usually was played shortly after the meal and went home with the person who found the almond. Bedstefar was known to find the almond and slip it to a grandchild sitting near him, without anyone noticing. Great recipe, I’ve just prepared some for tonight’s serving of risalamande (: Do you happen to have a recipe for the cherry sauce? I currently live in a country where such is unavailable. Is there a way to make it from scracth? Thanks :-) Actually I have never tried preparing cherry sauce from scratch. However, some other person left this comment on this recipe for Risalamande. Maybe that can help you. Which is pitted sour cherries cooked in water and sugar. I heat the cherries and syrup and thicken it with water and potato starch. one summer, as a very young girl, We went to Denmark as a family. Parents and my 5 brother and sisters. A danish family of 6 children invited us for a meal. Must try and make it for my family here in France ! This makes a cherry sauce very close to what you get in Denmark. Merry Christmas / God Jul. i made this for a new years party and it turned out great! i only used one vanilla bean but i think i could have used two. i couldn’t find short grain or pudding rice, so i used what i had (long grain) and it turned out great! i added more water in the beginning because mine was evaporating too fast. for cherry sauce, i just used pie filling that i heated up and added some water to. i would add one more note. this recipe says 4 people. that’s a lot of pudding for 4 people. it was prefect for my potluck party though. Dark Morello cherries in light syrup (from Germany) are available at Trader Joe’s. Ann I did not find them at TJ,but I will look next time. My answer is a little late, but is written in step 8 – Mix the vanilla with 2 tablespoons of sugar, add it to the cold rice pudding and mix well. So it needs to be added before the whipped cream. I have made this for years and have always served it with Cherry Heering, the Danish cherry liqueur. Itøs hard to find but a big liquor stores might have it. Also, I do not put water in the rice pudding, just milk. Sounds great! I use the water so it won’t burn to the bottom of the pan as milk can tend to do. I served an LDS mission to Denmark in the early eighties and brought this recipe home with me. I have made this many times over the years and my family can’t get enough of it. Funny, it is loved for breakfast, elevensies, lunch, afternoon snack, dessert, and a midnight snack, I have found that using Danish Dessert (that’s what it’s called) by Junket makes a great “homemade” fruit sauce and I always use strawberries instead of raspberries or cherries (I have tried both versions and neither of them pass the “good combination” test in my opinion– it has to harmonize with the pudding, right?). So I thinly slice strawberries and fold them into the Danish Dessert sauce and then I refrigerate it (i.e., I don’t go for the warm fruit sauce). Also, for the rice pudding part, I use as much Cool Whip as it takes to get a very fluffy consistency (very important in my opinion). I don’t want the pudding to be thick or pasty at all. I have used homemade whipped topping before but I actually prefer the extra creamy Cool Whip funny enough. I use Calrose Rice for the short grain that they are talking about– it is an expensive rice but you don’t want to compromise on this ingredient. I use whole milk– the pudding needs to be rich and creamy. One other thing, I prefer to mince the almonds so that they don’t produce a crunch in the otherwise soft pudding. I am a real consistency, texture kind of guy (you know, no crunchy onions in a potato salad sort of thing). Have fun. I am getting ready to make this for some Swedish guests that are visiting. Wish me luck. That just sounds great! I just use a small amount of water in the beginning so the milk isn’t burning to the bottom of the pan that easy. Aren’t you supposed to put some sherry into it? My mother’s recipe calls for it and is adds just the right note. 25 gr. almond (with skin off) or more to your liking. Bring the milk to a boil and add the rice. Stir often (burns very easily). Let it cook for 45-60 min. Cool the “groed” (milk and rice mixture). Can easily be made a day ahead. Stir the “groed” with sugar and sherry. 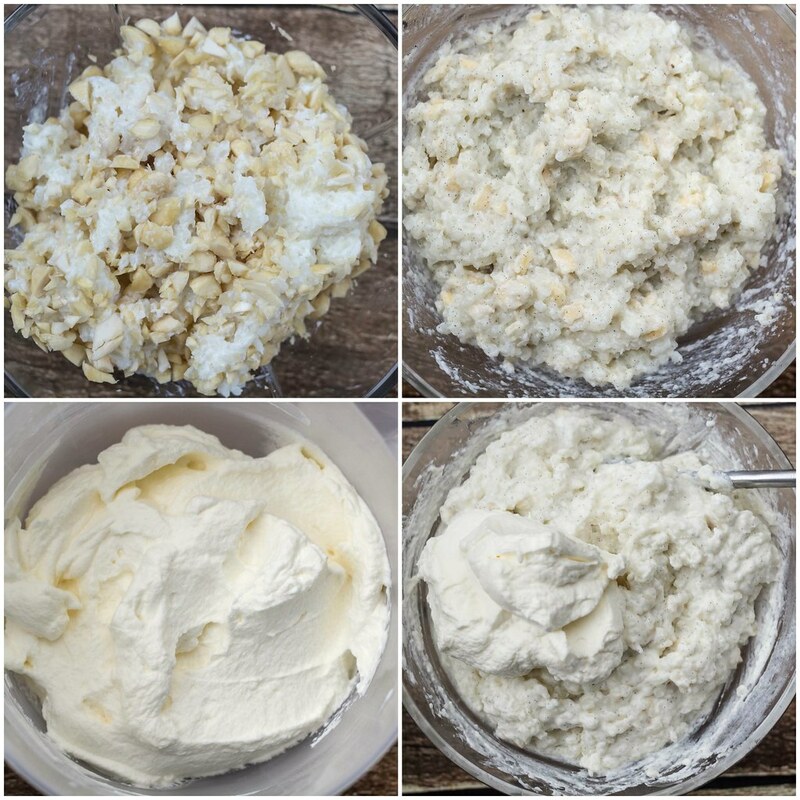 Add the chopped peeled almonds and add the whipped cream. Have one whole almond and some halves and quartered ones to make the game more interesting. Serve with a lukewarm cherry sauce. Strawberries can be used in stead of. Boil the fruit (use frozen) in a bit of water. Thicken it and use as much sugar as you want to sweeten it. I’m Danish, yes I add 2 T of Sherry, giving a very delicate taste. Thank you very much for such an informative description of Ris ala`mande. I have made it today for our New Years Eve in Australia :) We just make some warm Raspberry sauce instead as hubby and I are not so keen on the Cherry sauce. I just buy frozen Raspberries and add some caster sugar and heat it up in the microwave, its that easy. We live in Australia now but use to also have the traditional Danish Christmas dinner. I make my own red cabbage here with oranges or sweet apples its full of flavor. Happy New Year 2016 lets pray for an even more beautiful year filled with joy and love, God bless….???? I’m so happy you could use the recipe, and how lovely with the raspberry sauce! I just found your recipe for risalamande, my dad was Danish and when we stayed there many years ago, my aunt Inger used to make this dessert, I am going to make this for our Christmas dinner this year. Thank you. Carol. Then you are half-Dane :-) I hope you will enjoy the Risalamande. Love this. Thank you so much for sharing. I had an old old Danish recipe book. But was in danger and had to hurry and get out. I it was one of my things that I had to leave. I really enjoy being able to get this recipe back. Hi, I was wondering if JAPANESE SUSHI RICE would work? It’s short grain. I want to make HIS before Christmas to see how I like it. I may be only 16% Danish but I love embracing Danish culture! I had the same question, and the comments on another Risalamande recipe said sushi rice was almost identical to what they use in Denmark. I tried it, and though none of my family have any basis of comparison (I’m only partly Danish by way of a grandfather who died before I was born, and we weren’t really raised on Danish cooking) everybody was raving about how delicious it was, so I must have done something right! Hi Kiryn. Thanks for sharing that good information. I’ve never tried sushi rice but I can absolutely imagine they would work perfectly. I regularly use Jasmine rice. I use sushi rice in mine–works great! Danish “pearl rice” is only a little bit shorter grain than sushi rice. Once I used Asian sweet rice, also called glutinous rice. BIG mistake. It was a gummy mess, almost impossible to fluff up to get it to where it could be folded into the whipped cream. My son spent a year studying in Denmark last year and is home now. One of his Danish friends is visiting us this year and he made this for us last night. How delicious! Thank you for sharing the recipe and I plan to make this again. Of course, we have a big bowl of it still in the refrigerator. :) God ferie. Hi. I have done some studies in the states as well and I also know some Americans from my university in Denmark. I happy that you like this Danish Christmas dessert. Have some good holidays as well. Hey. Do you think I can make this recipe with long grain white rice? I wanna make this tomorrow. Jo Linda. Actually, I don’t think the result will be the best if you use long grain rice. I don’t think you will get the nice sticky effect. When that s add id, I’ve never tried myself. Hello, I am from Northern Canada and because we can’t always find cherries, I use canned plums. I grew up eating this every Christmas. My grandparents were from Denmark and came to Canada in 1936. The recipe they used was pretty much the same. Tomorrow is Christmas Eve, I can”‘t wait! Hi. Yes you can use short grain rice. Twenty five years ago my aunt and uncle hosted a Danish exchange student. My mom wanted to make him feel more at home for Christmas, so she asked him what dish she could make for him, and he described this dish to her. It has since become a loved tradition and we have it every year, even with the whole almond and the prize. Since our Danish cousin Kim returned to Denmark, he has visited several times, bringing his family with him. My mother talked to his mother, and she said she never made it! Even so we’ve been enjoying it for years and have always called it Danish rice pudding, even though we were making Risalalmande. How delightful to know the correct name and that it wasn’t just a figment of Kim’s imagination! Hi Kristina. What a lovely story. I happy to know that this dessert is also a tradition outside Denmark. Would Arborio work for this recipe? Many thanks! Have you ever froze the rice pudding before? Thinking about trying to make it ahead. My grandfather came to Canada from Denmark in 1926 when he was 16 years years old. My parents took us on a family vacation to visit the aunts,uncles and cousins back in 1985 for Christmas that year. 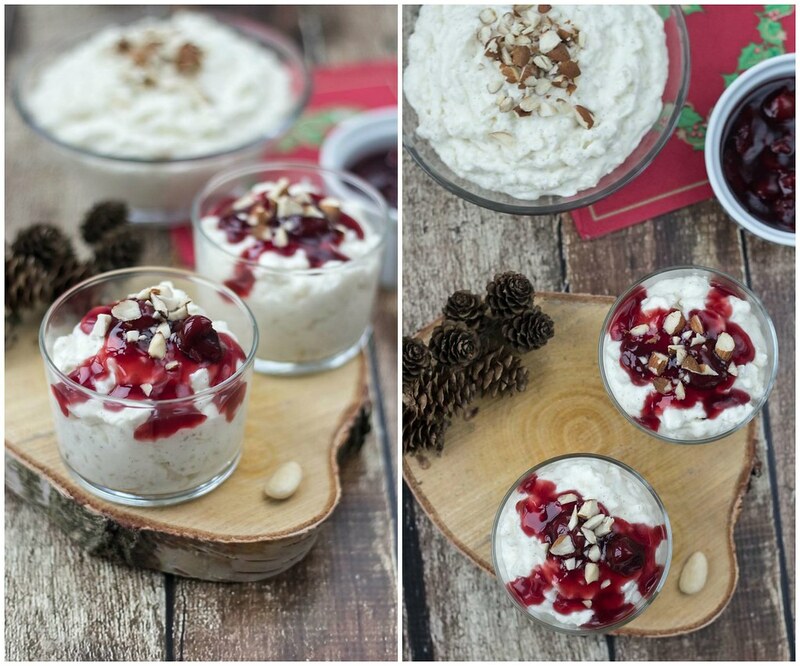 We brought back the Danish Rice Pudding tradition and have done it every year since! P.S I’m a Nielsen too Grandpa had to change the spelling when he got into Canada to Nielson! I think you can probably freeze the cooked rice part but I wouldn’t try freezing it once you’ve combined with with the whipped cream. I think whipped cream that has been frozen will separate when thawed. Someone commented above that he uses Cool Whip, which can be frozen & thawed many times without changing in consistency but that’s because it’s made of vegetable oil and chemicals (or something–I’m not even sure). I would consider it if I had to make this dessert for someone who couldn’t tolerate dairy, but otherwise, no. I use a double boiler to cook the rice so that there’s no danger of it scorching. No need to stir it at all while it’s cooking, just cover and let it cook. It takes about 45-60 minutes total. As a Dane myself, I have to say that I have never seen anyone adding almonds, that were not peeled, into the mix. That is particularly interesting to me. I made this recipe successfully for our family’s “Danish Christmas” dinner, after a little bit of trial and error. The recipe doesn’t indicate how much sugar to add to the pudding or when to add it. I used 1/4 cup and added with the milk and vanilla. When I boiled the rice with water in the beginning, there was so little water, the rice turned into a hard mass very quickly. The recipe doesn’t indicate what quantity of almonds to use. Despite these few problems, I was able to make a rice pudding that my family enjoyed. My son in law who lived in Denmark for two years said it was like the rice pudding he ate there. We used a Greek cherry sauce we already had in the pantry, and we also enjoyed the leftovers with homemade raspberry jam as a topping. Thanks for this recipe – and your pictures are gorgeous! Sorry for my mistake in the previous comment – now I see you added the sugar after the pudding is cooked. I didn’t understand that step. Arborio rice worked well for me when I was living in Mexico .I have cooked the chopped almonds with the rice and milk and sugar .then added the whole almond and whipped cream the next day. Nobody has mentioned that in Denmark we left out a dish of the rice pudding,groed, fo Santa Claus.